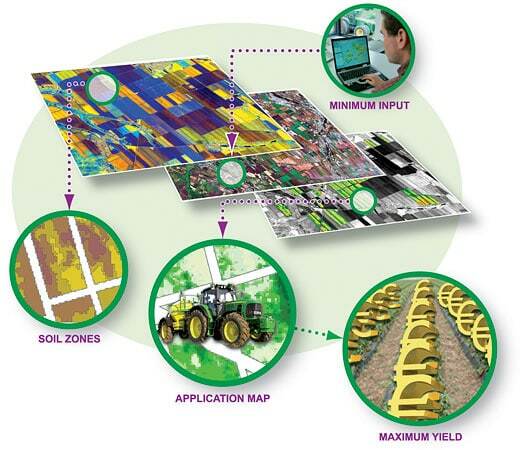 is the logical evolution of Precision Farming. 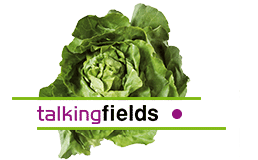 Within arable farming, this covers all management methods that take into account the small-scale differences such as soil types within a single field. While precision farming is focused on the technology for precise application, the emphasis of smart farming is on information-guided crop production. provide an overview, show patterns and allow an estimation of the heterogeneity within fields. Thus, these images can support farmers in their decision-making processes. 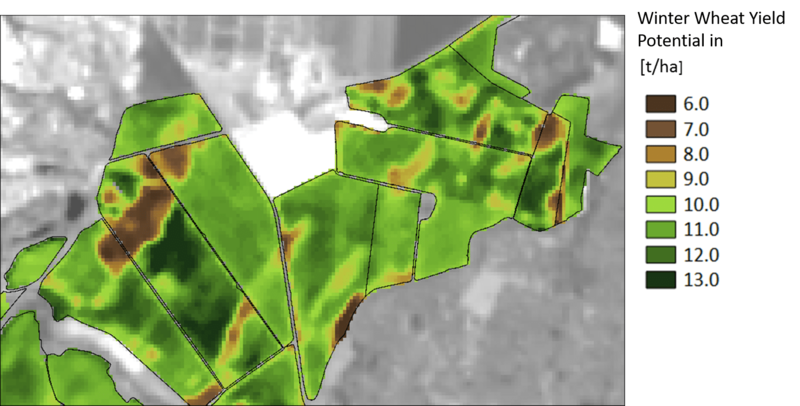 Satellite data can be used to perform a crop vigor analysis for each field to determine the potential of the location. This makes it possible to estimate the economic advantages of future site-specific management. 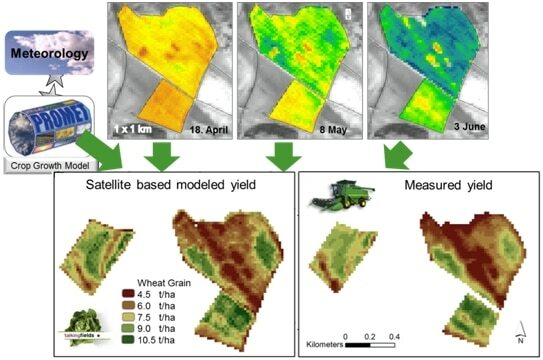 Parameters that cannot be seen directly from the satellite, such as dry biomass or grain yield, are simulated in TalkingFields using a crop growth model that uses remote sensing data as current spatial input. Yield modeling provides an early overview of crop development and results in realistic forecasts for the final yield. 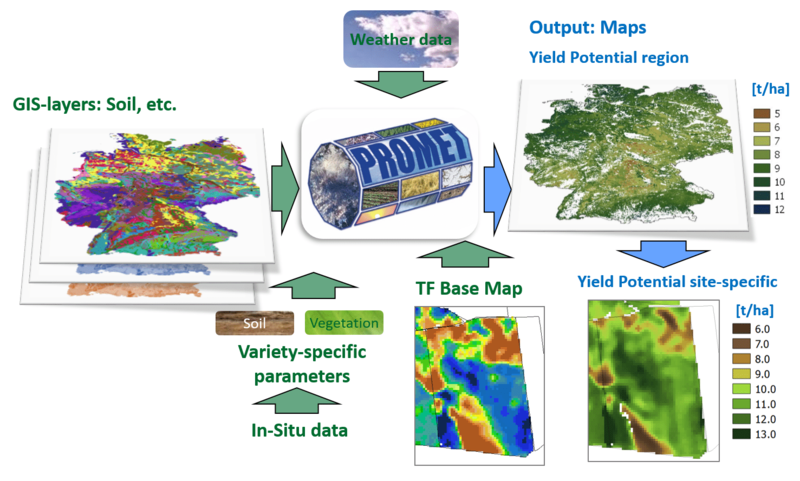 The combination of modeling the large-scale yield potential over 10-20 years with the TF Base Map provides a quantitative Yield Potential Map, which can also be compared with measured yields. Highly scalable modeling with the crop growth model PROMET enables the field-by-field simulation of your crop as well as a Germany-wide modeling of the average yield potential, e. g. for winter wheat. 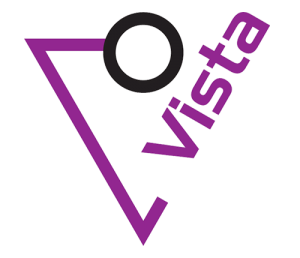 If you are interested in more details about our methods or customized solutions, please visit our company homepage www.vista-geo.de or contact us via the contact form.